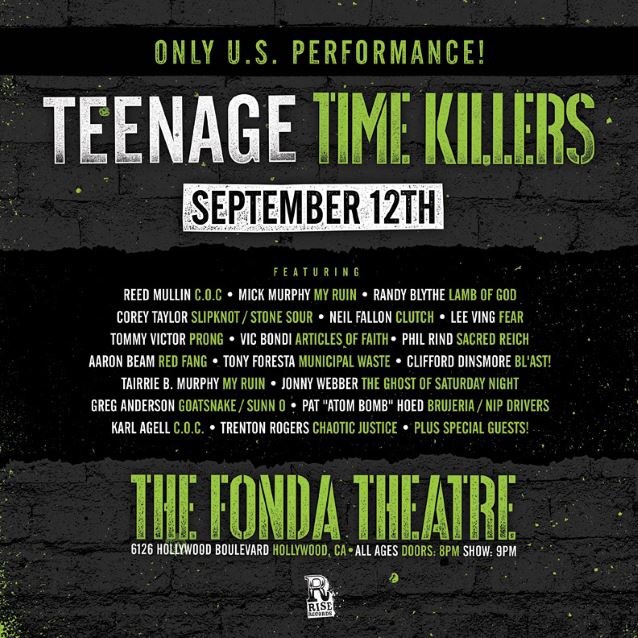 Teenage Time Killers, the band featuring core members, Reed Mullin (Corrosion Of Conformity), Mick Murphy (My Ruin) and John “Lou” Lousteau, along with multiple special guests, have announced a one off U.S. Show. The group will perform at The Fonda Theatre, in Hollywood, CA, on September 12. 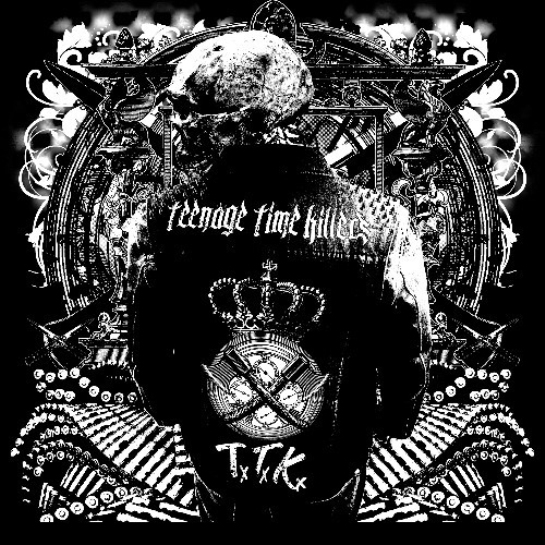 Teenage Time Killers are streaming their debut album, Greatest Hits Vol. 1, in its entirety via The New York Times. The effort will be released on July 31, and features multiple guest stars, along with the core members, Reed Mullin (Corrosion Of Conformity), Mick Murphy (My Ruin) and John “Lou” Lousteau. 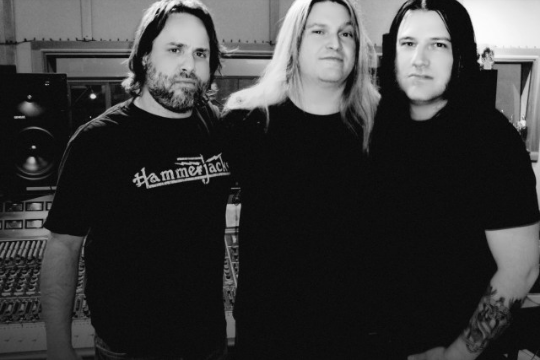 Teenage Time Killers have released a new song titled “Crowned By The Light Of The Sun“, featuring Neil Fallon (Clutch), Dave Grohl (Foo Fighters) and Jim Rota (Fireball Ministry). This song will be on on the band’s debut album, Greatest Hits Vol. 1, which will be released on July 31. The effort will feature multiple guest stars, along with the core members, Reed Mullin (Corrosion Of Conformity), Mick Murphy (My Ruin) and John “Lou” Lousteau. Teenage Time Killers have released a new song titled “Ode To Sean Hannity“, featuring Jello Biafra (ex-Dead Kennedys), via Noisey. This song will be on on the band’s debut album, Greatest Hits Vol. 1, which will be released on July 31. The effort will feature multiple guest stars, along with the core members, Reed Mullin (Corrosion Of Conformity), Mick Murphy (My Ruin) and John “Lou” Lousteau. Teenage Time Killers have released a new song titled “Barrio,” featuring Matt Skiba (Alkaline Trio) and Brian Baker (Bad Religion). This song will be on on the band’s debut album, Greatest Hits Vol. 1, which will be released on July 31. The effort will feature multiple guest stars, along with the core members, Reed Mullin (Corrosion Of Conformity), Mick Murphy (My Ruin) and John “Lou” Lousteau. Teenage Time Killers have released a new song titled “Hung Out To Dry,” featuring Randy Blythe (Lamb Of God) and Dave Grohl (Foo Fighters). This song will be on on the band’s debut album, Greatest Hits Vol. 1, which will be released July 31. The effort will feature multiple guest stars, along with the core members, Reed Mullin (Corrosion Of Conformity), Mick Murphy (My Ruin) and John “Lou” Lousteau. Teenage Time Killers have announced that their debut album will be called Greatest Hits Vol. 1. The album will be out in early 2015 and will feature multiple guest stars, along with the core members, Reed Mullin (Corrosion Of Conformity), Mick Murphy (My Ruin) and John “Lou” Lousteau.